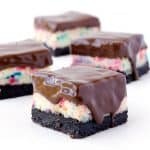 Delicious baked funfetti cheesecakes dipped in chocolate! Preheat oven to 160 C (320 F). Lightly grease and line an 8 inch square pan with baking or parchment paper, ensuring two sides overhang. Add Oreo cookies to food processor and whiz until crushed into fine crumbs. Pour over butter and mix well. Place your crumbs into your prepared pan and press down gently to form one even layer. Pop in the fridge. Next, add cream cheese to a large mixing bowl and beat until smooth and creamy. Add your caster sugar and vanilla and beat again. Then add eggs, one at a time, until combined. Then stir in greek yogurt. Finally add sprinkles and gently fold but try not to over mix. Pour cheesecake filling over Oreo crust and smooth over the top. Bake in the oven for approximately 35 minutes or until it no longer wobbles in the middle. Try not to over bake it as it will continue to cook as it cools. Leave cheesecake in the oven with the door ajar for at least one hour. Then remove and leave to cool slightly on a cooling rack before transferring to the fridge. The cheesecake is best left in the fridge for 3-4 hours (or overnight) until it cools completely and becomes nice and firm before slicing. Melt chocolate in the microwave, stirring every 20 seconds, until smooth. Stir through the oil. Carefully chop the cheesecake into squares and then dip each one in the chocolate and set aside for a few minutes to set.